Rectangular plaque mounted on a rectangular shape wooden back board. Lettering is carved in black. Latin inscription (motto) is located at the last row of the texts. 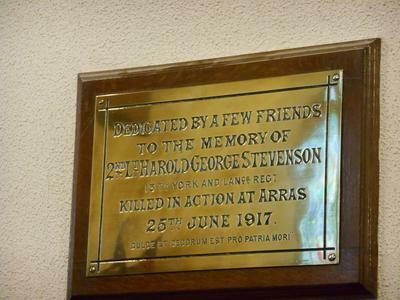 DEDICATED BY A FEW FRIENDS/ TO THE MEMORY OF/ 2ND LT HAROLD GEO. 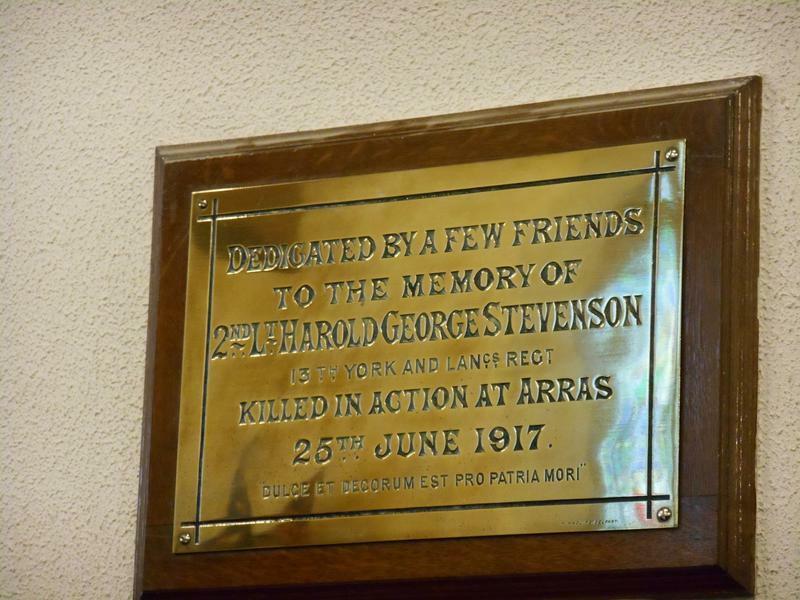 STEVENSON,/ 13TH YORK AND LANCS REGIMENT./ KILLED IN ACTION AT ARRAS/ 25 JUNE 1917./ "Dulce et decorum est pro patria mori"
1) 'Carved in Stone' ISBN 0-9254698-04-1 by the Belfast branch of the North of Ireland Family History Society, C/O School of Education, Queens University, 69 University Street, Belfast BT7 1HL, 1994. 2) www.irishwarmemorials.ie (Irish War Memorials) (recorded by Johnny Conn, 15 February 2007.